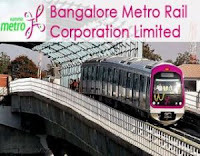 Namma Metro, also known as Bengaluru Metro is a metro system serving the city of Bengaluru, India. It is currently the second longest operational metro network in India after the Delhi Metro. Candidates who have completed Any Graduate or equivalent from a recognized Institute for BMRCL Recruitment 2018. Eligible & Interested candidates can download the Notification & Application form on the Official website page at www.bmrc.co.in BMRCL Recruitment 2018.